Relax and get ready for bed! Our three piece bundle will help lull your child to sleep. 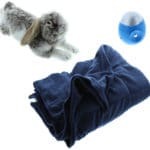 Our Vibrating Rabbit (#9319) provides comfort and emotional support while our Weighted Blanket (#3990) helps your child relax and feel safe and secure. The Star Projector Sound Machine (#2130) plays soothing night time sounds and projects twinkling lights.